Diplodocus has a weirder skull than I remember. Normally docile but has been seen to be a bit of a troll, is known to grab-and-toss the occasional unsuspecting bystander. do NOT approach from behind, it is well aware of it’s not-so-armoured hind legs. 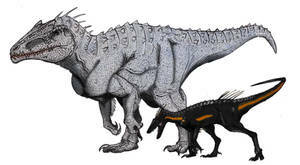 I wish this was the Ankylodocus we got. This thing is build like a fortress tower! God, I wish this was in the game. wonderful concept and great execution of it! yet again bringing the paleo goods! having these two creatures in one seems pretty contradictory to an extent, only really because of their tails. diplodocus has a long whip-like tail that can shatter bone and break the sound barrier, while ankylosaurus has a well proportioned tail with a massive bone crushing club on its end with occasional-- likely with spikes, rather. a-anyway i love this! reminds me a bit of the Turtosaur from The New Dinosaur. You're great at making alien looking dinosaurs and hybrids! This looks so much better than the derpasaurus! Loving this new design. It really nails that perfect balance between Ankylosaurus armouring and Diplodocus body frame while making it look sturdy and intimidating. You never cease to amaze, Tapwing! Soooo much better than the official one! This is actually cool and surprisingly natural. Aha, now there's something that I actually like. Looks tons better than the actual one. There is no single way I can describe how much of an improvement this was. I wish this is what it actually looked like... and I wished it could fend itself in JWE like you put there in the sketch. Way to blow the in game designs out of the water, this is an amazing illustration! What a great merging of both of the animals shapes, into something that looks not only aesthetically appealing, but can also pack a significant punch! Your concepts are always a delight, Tap! Much, much better than any Ankylodocus maded to Jurassic World! It's gorgeous. Ohh, love it! Somehow this looks more plausible than a real ankylodocus! Probably because the real ankylodocus looks like to dinos where slapped together, this art peice is SO much better! oh my word this is beautiful! I would have much rathered this!